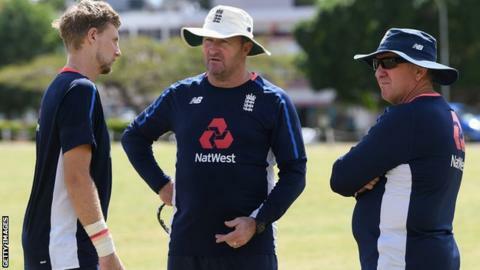 England assistant coach Paul Farbrace is to become the sport director of county side Warwickshire. The 51-year-old former wicketkeeper will succeed Ashley Giles, who left Edgbaston to become managing director of England men's cricket last month. Farbrace first became England assistant coach under Peter Moores in 2014 and stayed on when Trevor Bayliss was appointed the following year. He will join Warwickshire after the West Indies tour, which ends in March. Farbrace will work with head coach Jim Troughton, with the club back in the top flight of the County Championship after winning the Division Two title in 2018. But his responsibilities will also cover the women's teams and performance pathway. The appointment means he will not be part of England's coaching team for the World Cup and Ashes series. "Warwickshire is a very special club with incredibly proud traditions, and I'm very excited at being given this opportunity," Farbrace said. "Whilst having won trophies across all formats in the last 10 years, the squad has gone through a major transition process in the last two years and it has a very exciting future following the emergence of several talented young players." Farbrace was first-team coach with Kent in 2010 and later coached Yorkshire's second XI before a spell as head coach of Sri Lanka, during which he guided them to victory in the 2014 World Twenty20. Last year he reportedly turned down the chance to take charge of Bangladesh's national team. "Paul was an outstanding candidate throughout our recruitment process and we believe that his all-round experience made him the ideal person to work with Jim Troughton and the rest of the performance team to drive the club forward," said Warwickshire chief executive Neil Snowball. "Paul has been one of the most sought-after coaches in the game in recent years, and we are delighted that we have been able to secure his services here at Warwickshire."